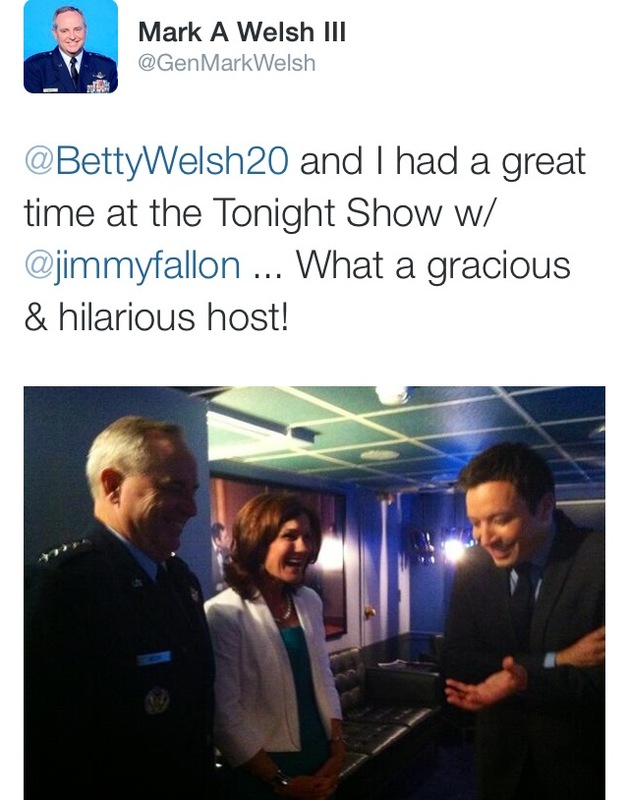 Air Force Chief of Staff Gen. Mark Welsh and wife, Betty, met the virtuoso of late night TV yesterday, and Jimmy Fallon and crew seem like they all had a good time. “@BettyWelsh20 and I had a great time at the Tonight Show w/ @jimmyfallon…What a gracious & hilarious host!” Welsh tweeted from his official twitter page. They also met Dolly Parton, Fallon’s guest star of the night. “Pretty cool to thank @DollyParton for a lifetime of giving & watch her rock the stage. My fav…’The Sweetest Gift’,” Welsh later tweeted. Welsh is in New York City this week speaking with various media organizations about current Air Force issues and “the future of the Air Force,” Air Force spokesman Lt. Col. Timothy Heritage told Air Force Times. Welsh will make an appearance on the CBS This Morning show tomorrow, and sat down with the Council on Foreign Relations as well as The New York Times for an editorial board, Heritage said. Check out more tweets from Welsh here. I’m glad there is time in the day to meet with celebrity A-listers while 10,000 people from his organization have waited over 100 days to find out if they can start a civilian life. While we were lied to over 3 times about finding out our fate, you reassured us that something would be done. Nothing has been done and nobody seems to care about this injustice of the date of notification moving over 3 times. This big lying bag of dicks is heading our organization in the same direction is has always been going. great job Sir. Nice job with your Chief who says you are tired of lying to DC, so instead of lying to congress, go ahead and lie to us.